From a Cornell Chronicle article by Sarah Thompson, 7/31/2012. “We’re at a key juncture in New York, where we’re deciding whether or not to extract more fossil fuels locally. At the same time, we need to explore renewable energy options that will stimulate the local economy and not contribute to global climate change,” Smart said. 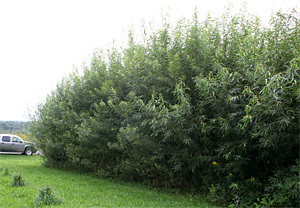 Visit Willowpedia – Willow Energy Crop Information Resource at Cornell University. The season has started, and we are happy to announce that — despite the spring frosts that had a devastating effect on New York fruit crops — we will be able to offer limited amounts of peaches, apples, pears and berries this season. For the month of August, our retail store will be open every Thursday and Friday, 10 a.m. to 4 p.m., starting August 2. See website for latest info. We also have our Cornell Orchards Butters and Jams available for you this year again. NY95.0301.01 (left) is an organic dark red wine grape with a hint of blueberry flavor. NY76.0844.24 is a cold-hardy white wine grape. 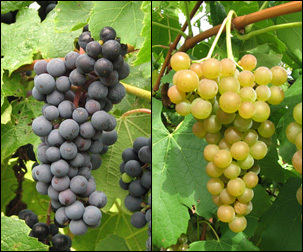 “Cornell scientists are asking the public for names for two new wine grape varieties that will be released from their breeding program in 2013. “The two latest varieties from grape breeder Bruce Reisch include a cold-hardy white wine grape and an innovative organic dark red. The first conjures up citrusy aromatic characteristics; the second has a hint of blueberry. Their current names — NY76.0844.24 and NY95.0301.01– are far from inspiring. “Reisch hopes that a contest and social media campaign will help change that. He is accepting name submissions at bruce.reisch@cornell.edu until Aug. 6. Mann Library has an open position for a plant care student worker. This would be a great chance not only to hone their skills, but to also participate in expanding our collection of plants to further improve the atmosphere in Mann. We can hire as soon as possible, hopefully no later than the start of classes. Performs weekly care and feeding of plants in all public spaces in Mann Library with minimal supervision, 2 hours per week. Flexible schedule. Must have horticultural experience (greenhouse, nursery, etc.). Students of botany, horticulture or other plant sciences preferred. Pay rate commensurate with level of experience. New guide offers organic farmers tips for storing produce [Cornell Chronicle 7/17/2012] With organic produce reaping a growing marketplace share, farmers who can keep their crops fresh longer will benefit from more marketing options. But it takes know-how. 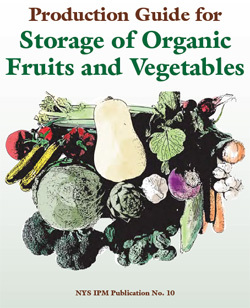 The new and free 2012 Production Guide for Storage of Organic Fruits and Vegetables, by Christopher Watkins and Jacqueline Nock and posted online by the New York State Integrated Pest Management Program, can help. Pilot program aims to cure ‘plant blindness’ among high school students [Cornell Chronicle 7/11/2012] A Cornell pilot program, Plantations Environmental Education Program for Sustainability (PEEPS), aims to give high school students an appreciation for plants. 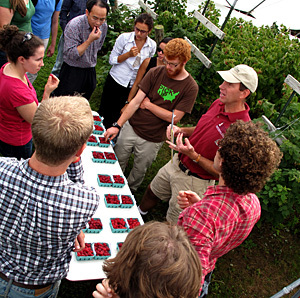 Courtney Weber (in hat) conducts taste testing with horticulture graduate students. From Mary Woodsen, NYS IPM Program. More info, contact: Elizabeth Lamb em38@cornell.edu. GENEVA, NY: Susan and Tom Palomaki knew that greenhouses provide perfect moisture and warmth, not just for plants, but for pests. But in 2005 when they bought Lucas Greenhouses in Fairport, NY, with over a million plants under one roof, they didn’t want to be tied to the weekly spray routines commonly used to combat greenhouse pests. The Palomaki’s first priority—finding a better, gentler way to cope with pests. Which led to their first permanent new hire—Debbie Palumbo-Sanders. Palumbo-Sanders’s background in plant pathology and plant science, coupled with her enthusiasm and curiosity, made her a natural for the job. Plus: she knew the core principles of integrated pest management (IPM) and was eager to learn more. Now the Lucas Greenhouses team has received an Excellence in IPM award for their leadership in promoting IPM to greenhouse growers statewide as well as to their customers. Among the IPM tactics well-suited to greenhouses is biocontrol. Because greenhouse conditions are ideal for them, too, these predatory insects or pathogens can really wallop pests. But although IPM growers can cut way back on the time and money spent spraying greenhouses, says NYS IPM educator Brian Eshenaur, working with tiny, sometimes microscopic living critters involves a learning curve. Lucas Greenhouses has become a major player in the mentoring circuit. They help the large wholesale growers who supply them—and even other retailers—get a handle on the sometimes-tricky tactics it takes to succeed at biocontrol. “We definitely see the ripple effect,” says Tom Palomaki. “Suppliers are sending us cuttings they’ve grown using biocontrols.” Which means many other retailers are getting the same high-quality, low-impact cuttings too. And if you’re a Lucas customer, Eshenaur says, you can’t miss the colorful banners hanging in the center aisle, explaining what IPM is and why it’s so important for plants and people too. “When garden clubs come through for tours we can just see the light bulbs come on,” says Palomaki. The Lucas team receives their award on July 24, 2012 at Cornell University’s Floriculture Field Day. 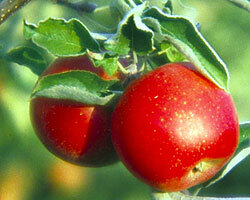 To learn more about IPM, visit the NYS IPM Program website. Nanotech Goes Country: MEMS Chips To Measure Water Stress Down On The Farm [Forbes.com 6/30/2012] – Alan Lakso, Department of Horticulture, and colleague Abe Stroock, a Cornell Microfluidics engineer, have jointly developed an electronic MEMS (microelectromechanical systems) device to measure water stress potential. 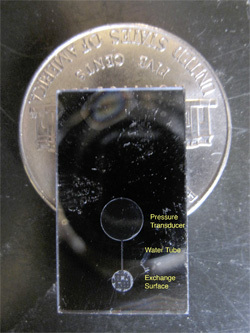 MEMS technology promises a reasonably-priced, continuous water stress measurement by monitoring plants directly, with a range some 100 times that of a classic tensiometer. Analyst has been at seed facility for more than half of its 100-year history [Cornell Chronicle 7/2/2012] – The New York State Seed Testing Laboratory (NYSSTL) at the New York State Agricultural Experiment Station celebrates a century of service to farmers across the state.